The Girl Scouts of Northeastern New York will be at the mall (in center court) selling Girl Scout cookies from late March through April. A wide assortment of cookies will be available including s’mores, trefoils, thin mints, do-si-dos, samoas, savannah smiles and tagalongs. 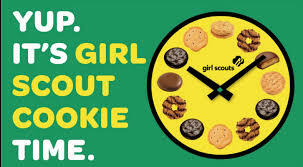 Proceeds from cookie sales help to provide local Girl Scouts programs in STEM, the outdoors, life skills, entrepreneurship, as well as camps, leadership training, and more! Friday, March 29, 4 p.m. to 8 p.m.
Saturday, March 30, 10 a.m. to 8 p.m.
Friday, April 5, 4 p.m. to 8 p.m.
Saturday, April 6, 10 a.m. to 8 p.m.
Sunday, April 7, Noon to 6 p.m.
Saturday, April 13, 10 a.m. to 6 p.m.
Sunday, April 14, Noon to 6 p.m.
Saturday, April 20, 2 pm. to 6 p.m.
Friday, April 26, 4 p.m. to 8 p.m.
Saturday, April 27, 10 a.m. to 6 p.m.
Sunday, April 28, Noon to 2 p.m.